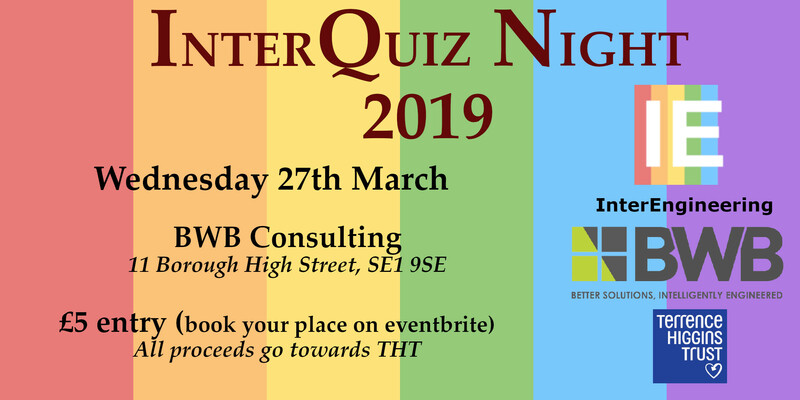 Come along to the 1st InterQuiz Night of 2019, in collaboration with BWB Consulting. Test your knowledge and compete against other LGBT+ engineers for the 1st place prize, as we raise funds for Terrence Higgins Trust. Terrence Higgins Trust supports people living with HIV amplify their voice and help the people using their services to achieve good sexual health. Please sign up individually, as everybody will be mixed into teams of 5/6. £5 per head (inclusive of ticket handling fee). All proceeds going towards THT. Arrive from 6pm, where the quiz will begin at 6:30pm. Upon arrival, buzz for BWB and go to the first floor reception, where the quiz will be taking place. Additionally, there is lift access available. Alcohol, soft-drinks and nibbles will be generously provided by BWB Consulting.